Been without a single speed for awhile. I'm not a dedicated SS rider, but I do enjoy it as a different sort of riding to what I normally do. Picked up a used '11 Spot Rocker frame with a decent build, including a sweet Speed Dream-built Flow EX to I9 wheelset. Got it out this morning for the first time. Seven or 8 miles on hella-rocky trails at Phoenix Mountain Preserves. Bike pedals like a dream. Geo is obviously a little old-school given its age. 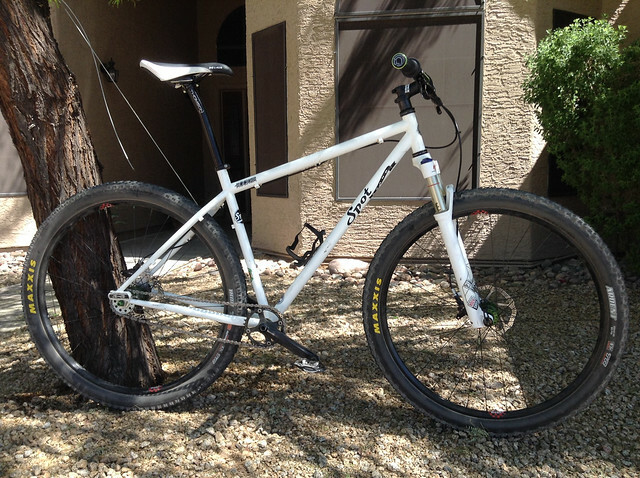 Would love to have a little more stack, couple degrees slacker and a half-inch or so more top tube. That said, the quality of steel in this bike is incredible. The only SS I've personally owned or ridden that rode this good was my Ti Raijin. Very impressed. Does have quite a few paint flaws. Seriously considering stripping it and have some sort of matte or flat clear powder coating done if the steel looks good. were you at OHSO yesterday? The N. Scottsdale one? No, but my wife and I were at 4 Peaks. Very nice bike, looks so smooth. After a full suspension gnar ride yesterday on National, I took the Spot out today for 10 miles of relatively smooth-ish desert singletrack out at the Hawes systems in Mesa. Really is an excellent bike. 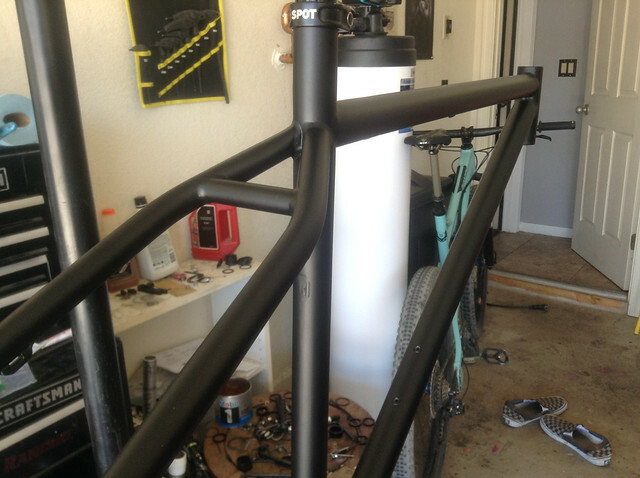 With some fat high-volume rubber at low pressure, the frame is incredibly forgiving. Hopefully Spot still carries some old sticker packs so I can strip all the janky paint off this thing. Anyone have any experience having extraneous cable stops removed from a steel frame? Would love to clean it up from an aesthetic perspective. Hacksaw and then a flat file/emery cloth to finish. If you want a raw finish though you'll have to get it bead blasted afterwards, otherwise you'll always be able to see where the stops were removed. The nicest raw finishes are those applied straight after welding, as you keep the oxidation colours at the weld areas - once you do any polishing/blasting you lose all that, of course. Nice looking bike, BTW - if you wanted to slacken it a bit you could always fit a -1 degree headset and run forks with 20mm more axle/crown. Andy: Thanks. Looks like the stops are just tacked on. I imagine I could use a small cutting wheel on my Dremel and accomplish the same thing. I wasn't aware you could get an angle set for a straight 1 1/8 head tube. 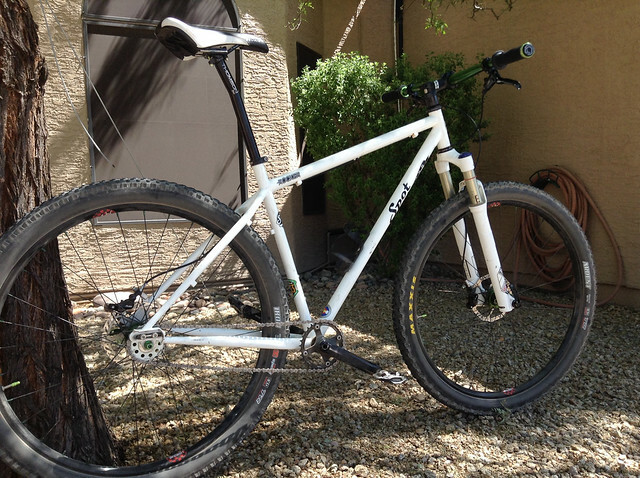 Currently has a 100mm Reba on it; if I could find a decent straight steerer 120mm fork, I'd probably swap that on. I'm definitely not doing a high-dollar refinish. I ride in Arizona rocks and our stuff gets pretty scarred up. I'll do the stripping myself and then see where I'm at for a refinish. Re. anglesets - I've used this one and it just does what it's supposed to with no problems - uses Cane Creek bearings, so spares are easy to find. As far as the cable stops go they'll most likely be brazed or silver soldered on and a Dremel probably would do the job - I just prefer a hacksaw and files. To follow up on this, I did remove the extraneous cable stops to make it a "true" SS frame now. Those stops were on there, ended up using a couple cutting wheels and a flapper disc on my angle grinder to get them fully cleaned up, before hand sanding. 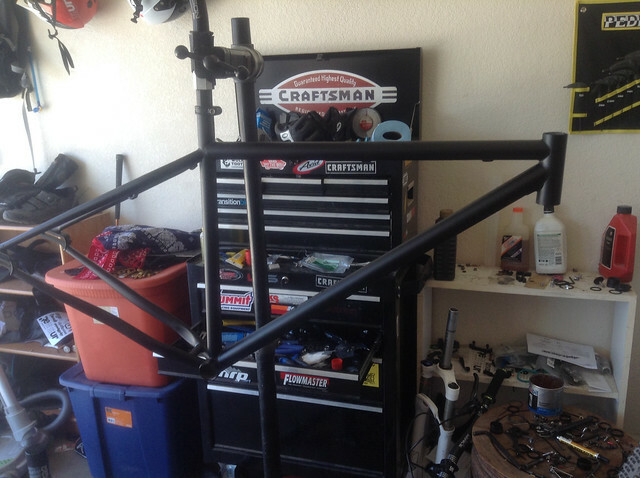 Also tried to do a chemical strip on the frame. Wow. I've chemically stripped a handful of aluminum frames previously and it was easy-peasy. The finish on the Spot frame -- particularly on the top and down tubes -- had to be a couple mm thick in spots and it did NOT want to come off. After about 8-10 coats in which I got about half the finish off, I gave up. Dropped it off at a local powder coater yesterday. 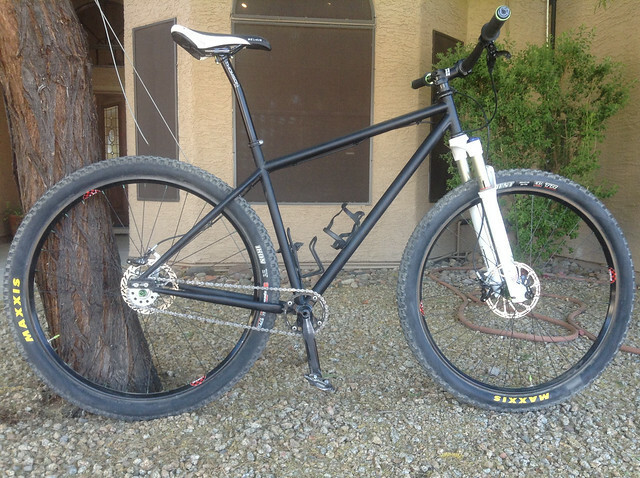 They'll bead blast and drop it into an existing scheduled powder run (super flat black) so I can have it by Friday. $45, which is a steal in my book. Yeah, 45 USD is a steal for that sort of job! I recon it would cost around the equivalent of 250 USD here. Can't wait to see the after paint job. Here's the finished product. I'm very pleased with it, particularly given the price. Spot does still have sticker kits available for $25, but part of me likes the clean industrial look. I'll probably think about it a bit. Took it out to get dirty on an 11-mile rocky sufferfest on Sunday and, as always, it worked like a champ.